APEC 2017 [Booth #824]—TAMPA, FL.—March 27, 2017—Today, Transphorm Inc. announced that its second generation, JEDEC-qualified high voltage gallium nitride (GaN) technology is now the industry’s first GaN solution to earn automotive qualification—having passed the Automotive Electronics Council’s AEC-Q101 stress tests for automotive-grade discrete semiconductors. Transphorm’s automotive GaN FET, the TPH3205WSBQA, offers an on-resistance of 49 milliOhms (mΩ) in an industry standard TO-247 package. The part initially targets on-board charger (OBC) and DC to DC systems for plug-in hybrid electric vehicles (PHEVs) and battery electric vehicles (BEV). Today, OBCs are uni-directional (AC to DC) using standard boost topologies. However, being that GaN FETs are bi-directional by nature, they become the perfect fit for the bridgeless totem-pole power factor correction (PFC) topology. Meaning, a bi-directional OBC can then be designed with GaN to reduce the number of silicon (Si) devices, weight and overall system cost of today’s solution. As a result, Transphorm’s GaN can be used in other high voltage DC to DC automotive systems including air conditioning, heating, oil pumps and power steering. Transphorm’s Quality + Reliability (Q+R) culture feeds into every aspect of its robust GaN-on-Si solution. The company vertically integrates into the complete design and development cycle—innovating at the epi layer, adapting the fab process to the product, configuring the device and developing customer design tools and resources. This core commitment to high Q+R enables the company to deliver the industry’s only GaN devices with proven quality, reliability and intrinsic lifetime data extending beyond JEDEC requirements. That Q+R played a critical role in achieving AEC-Q101 qualification. Transphorm’s GaN technology was subjected to a series of rigorous tests including parametric verification, high temperature reverse bias and high temperature gate bias. (A complete list of AEC qualification modules can be found here on pages 10 through 13.) Devices receive a simple pass/fail rating and must successfully pass all modules to become qualified. Track releases of other related tools and resources via Twitter @transphormusa #TPHTool. Inquiries related to design specifications can be submitted here. 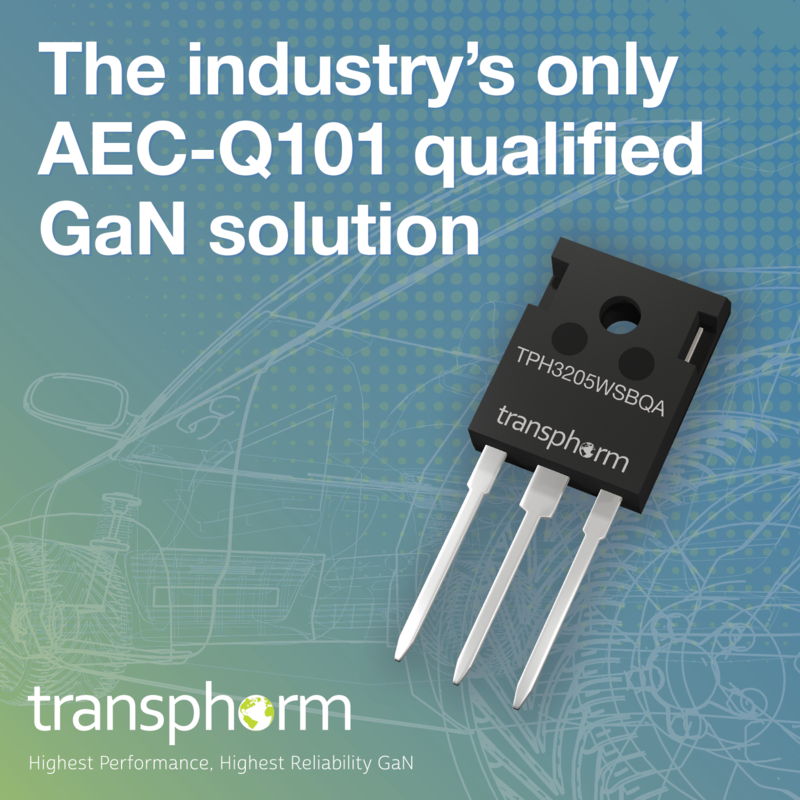 Transphorm is a global semiconductor company, leading the GaN Revolution with the highest performance, highest reliability GaN devices for high voltage power conversion applications. To ensure this, Transphorm deploys its unique vertically-integrated business approach that leverages the industry’s most experienced GaN engineering team at every development stage: design, fabrication, device and application support. This approach, backed by one of the industry’s largest IP portfolios with over 600 patents, has yielded the industry’s only JEDEC- and AEC-Q101-qualified GaN FETs. Transphorm’s innovations are moving power electronics beyond the limitations of silicon to achieve over 99 percent efficiency, 40 percent more power density and 20 percent lower system cost. Join the revolution at transphormusa.com and follow us @transphormusa.